Top Cat is a male and female independent professional driving school offering driving instruction to Edinburgh and surrounding parts of East & West Lothian and Midothian. 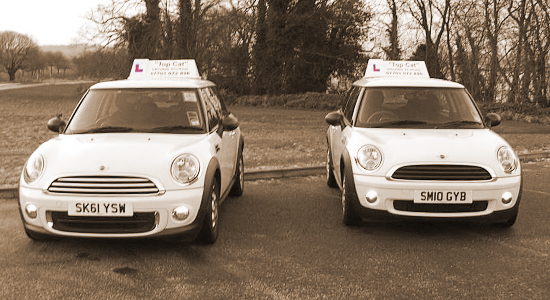 We sport both female driving instructors and male driving instructors. My name is Trudy, I am friendly, patient, reliable and dedicated to providing the highest standard of learning to drive focused on the needs and requirements of each pupil to make the learning enjoyable too. I'm also a PASS PLUS driving instructor! Most of my pupils have come on recommendation from the people who have already passed their driving test and I have a very high pass rate. I can teach from the very beginning to offering refresher courses for the full licence holder. 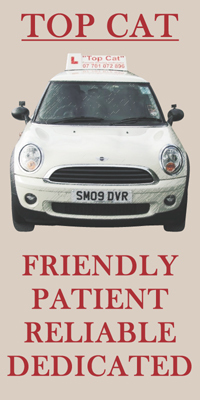 The driving lessons are in a BMW Mini and can start from home, work, college etc. We also have a male driving instructor with a larger car if that's what you prefer. Driving lessons range from 1 to 2 hours depending on the pupil. A progress sheet is kept and evey lesson notes are taken of what was covered and also what the strength and weaknessess are, especially for preparation for the test. I also offer advice and support for learning to pass the Theory test. I cover the Edinburgh and surrounding areas (East Lothian, West Lothian and Midlothian) and offer special discounts for block bookings and students. I can also provide gift vouchers for that special occasion. We now also have a male driving instructor! ADI or PDI required, please contact Trudy on 07701 072 896.